These particular models of belt sanders featured below are our top picks based on research that we did, considering all of the popular belt sanders on the market. We looked at performance, customer satisfaction, power capability, size, speed and other features. These three choices topped the list in all of these categories and became our top picks. Any one of them would be an excellent addition to your workshop. Belt sanders are used for a variety of home and professional projects. They come in many sizes and shapes that can be matched to the type and size job you are doing. Belt sanders are different from orbital sanders in that they have a continuously moving sanding surface that is mounted on a belt. Belt sanders don’t work for every sanding job they are invaluable for sanding large surfaces or flat surfaces quickly and efficiently. With all of the choices on the market, you may worry about how to choose the right belt sander for your needs. We have provided several tools for you to use in order to find that perfect belt sander for your projects and preferences. We’ve posted detailed reviews on three top rated belt sanders below. These particular models are the top picks based on research that we did, considering the popular belt sanders on the market. We looked at performance, customer satisfaction, power capability, size, speed and other features. These three choices topped the list in all of these categories and became our top picks. Any one of them would be an excellent addition to your workshop. 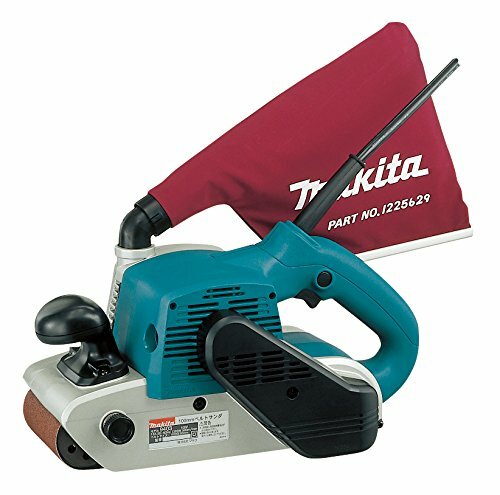 The extended base of this double-insulated, Makita 4” x 24” belt sander allows flush sanding for any number of projects. The wide 4” belt allows users to remove a lot of material at once but you won’t go deaf using it thanks to the 84 dB that keep the noise level down. This sander is the quietest in its class. The large front grip is comfortable to use and control with an easy lever control that makes changing sanding belts simple, fast and easy. The whole sander only weighs 13 pounds and provides a speed of 1640 feet per minute so you can get jobs done quickly. The ceramic wear plate is replaceable and eliminates long maintenance periods. The low profile gives the sander balance and reduces gouging. The labyrinth construction seals the motor and bearings and protects them from sawdust. Dust will be kept to a minimum with the attached, cloth dust bag that swivels 360 degrees. The cord is located on the upper portion of the handle for convenience. The Makita 9403 belt sander comes with a 1 year warranty. 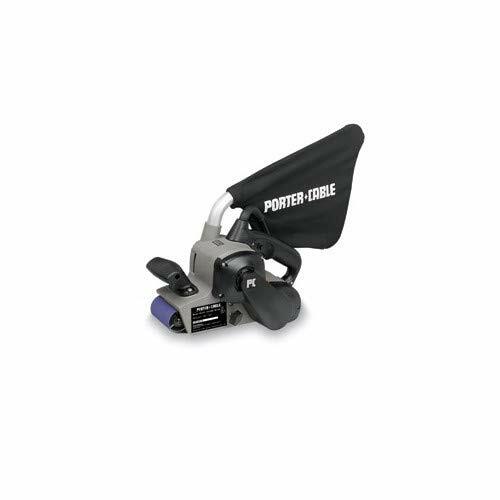 Porter-Cable brings you a belt sander that is perfect for woodworking, cabinet making, remodeling and home improvement projects and is a great addition to your workshop. The 8 amp, 3” x 21” belt sander offers power and versatility. This sander is used for heavier jobs such as sanding floors, repairing or fine tuning table tops and other projects that have large areas that need to be sanded. Features of the Porter-Cable 352VS belt sander include an all-metal housing that adds enough weight to make it unnecessary to press down while you sand, and that gives the tool a nice solid feel to it. The variable speed ranges from 850 SFPM to 1300 SFPM, providing plenty of speed to take care of large sanding jobs quickly. The quick release belt change lever makes changing sanding belts super quick and efficient. Other features include an extra large dust collection bag that swivels 360 degrees so it can be moved out of the way when you are sanding in tight spaces. One of the pluses of this sander is that it does a terrific job of keeping the sanding belts centered without having to stop and re-center them manually while you’re in the middle of a project. 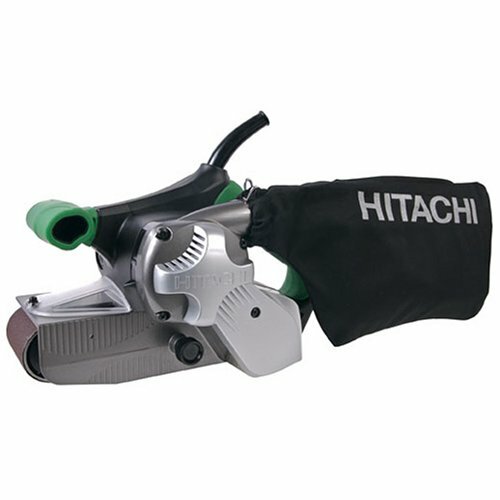 Hitachi’s 9 amps, variable speed belt sander provides plenty of power at 1020 watts to have the toughest material removal. The no-load speed ranges from 820 to 1475 SFPM making it perfect for wood, steel, paint removal and more. The Hitachi SB8V2’s service life is 2 times longer than other belt sanders because of the durable and wear resistant V-belt. You can easily sand projects, even in corners due to the location of the dust bag that is on the left side of the tool and the body is flush with the belt pulley on the right. The clear front cover, soft and comfortable, elastomer-covered grip on both the main and sub handles and a variable speed dial are other features that makes this Hitachi belt sander a favorite in many garages. The dust collection bag helps users keep the work area clean by reducing the airborne particles that get into the air. This versatile and powerful belt sander comes with a 5 year warranty that covers defects in materials and workmanship that is in effect from the date of purchase. This warranty is not transferable. All three of the high quality belt sanders above are great for a variety of projects, both for home use and professional use as well. Each of them has plenty of power and no-load speeds that will take care of plenty of material, especially on large sanding surfaces. Makita, Hitachi and Porter-Cable are all well known and respected names in power tools so you know you’re getting a great product that is going to last a long time and be able to handle a variety of different projects. When you are searching for the right belt sander for your needs, you want a tool that is powerful enough to handle those projects, whatever they are. This means that you have to know what kinds of projects you will be doing before you purchase a belt sander. Our buyer’s guide below provides you with more details about how to choose the best belt sander for your needs. With this information you will be able to sort through all of the choices and make an informed decision on the right belt sander for you. When you are shopping for a belt sander it is important to know the types of projects you will be using the sander for. Think about the kind of jobs you will need your sander for and determine what kind of power and features you will want. Knowing this information before you purchase ensures that you don’t choose a belt sander that isn’t strong enough to handle what you will be doing with it. Size – The size of the belt sander you choose is very important. If you will be using it inside cabinets or in tight corners, you don’t want to get a bulkier, larger sander. If you will be working a lot with larger pieces like furniture, you may even prefer a stationary sander. If you prefer a handheld sander, you want it to be as light as possible without sacrificing power or performance. Dust Collection – When you are doing heavy sanding jobs dust is a major concern. Most sanders will have some kind of dust elimination system whether it is the ability to attach to a shop-vac or it will have a dust bag that attaches to the sander itself for dust collection. Having a good dust collection method will help reduce the amount of dust flying around your workshop and being inhaled, which is not good for you. Variable Speed – Many belt sanders have variable speed options that you can use to adjust the sander to specific jobs. Single speed sanders are good for light and infrequent sanding jobs. If you do a lot of sanding and the jobs are on the heavy side, you will want a variable speed sander which overall has more power than the single speeds. Belt sanders are lighter than other types of sanders, which means they can be taken out to use and then stored away when you’re done, very quickly. Belt sanders are great for reaching difficult spots and you will have more control over the tool to cover the smaller areas easily and more accurately. The compact nature of a belt sander makes it a very popular tool to have. Belt sanders are a great choice for removing undesirable materials from surfaces such as paint or varnish without damaging the surfaces underneath. You will need to have the sander on the right setting and use a steady but firm hand. Workers like belt sanders because of the speed in which they sand larger jobs such as deck furniture, hardwood floors, floorboards, and many other larger sanding jobs. This is the a tool of choice because of their ability to handle sanding jobs faster than other types and are great for handling the initial major sanding of an item before the smaller details are handled. There are two basic types of belt sanders on the market: Stationary and Handheld. We have outlined the two types below and offered information about each so you understand the differences between the two. Stationary Belt Sander – Stationary belt sanders are designed to stay in one place and you bring the items to the sander to sand. The sanding belt in a stationary belt sander rests on top of the surface of the sander. Stationary belt sanders are much larger and heavier than their handheld counterparts. If you actually mount the sander to the workbench, it is known as a bench sander. This type of sander is designed for larger, commercial jobs. They can be used to sand both wood and metal and are most often used for tables and other objects that can be moved. Handheld Belt Sander – Most of the sanding jobs that you will encounter are accomplished with a handheld belt sander. These are smaller than the stationary sanders and come in many different sizes and shapes that will accommodate many different tasks. The sanding belt on a handheld sander is located on the bottom of the sander so the surface can be applied to the stationary object you want to sand. It is good for sanding floors and patios or decks due to the moveable nature of the sander. Handheld belt sanders will have different size belts as well as different motor speeds. The high speed motor will sand a surface much more aggressively than a slower motor will. Having the ability to choose multiple speeds gives the user more control over the sanding process and will allow them to adapt the sander to the project being sanded. Belt sanders have either paper or cloth belts that can be changed when they wear down. The different belts will have varying types of grit that ranges from extremely fine to very coarse. The higher the number, the finer the grit will be. Choosing the right grit will depend on the type of project that is being worked on. You wouldn’t want to use a coarse grit paper on a finishing project. Very coarse – Has very large grit and powers through surfaces very fast. You will need to be careful when using very coarse grit. When it is combined with the power and speed of the belt sander, it can completely ruin the surface you are sanding. Coarse – Coarse grit in not as abrasive as the very coarse grit and is good for sanding items that require a lot of sanding. Be careful using coarse grit because you can easily over sand the item and ruin the finish. Coarse sandpaper is suited well for sanding metal. Medium – Medium grit is considered a good all purpose paper. It’s used most often for wood projects and is the first type of grit used when you are preparing a project to be painted or varnished. It can also be used for removing marks and rough spots in wood and removing paint from surfaces. Fine – This is the paper of choice for getting projects ready for finishing. It is also used often to remove stains from plaster or water stains from wood. Although the finer tasks may not be suited to using a belt sander unless the user is highly experienced in handling the belt sander so no damage is caused. Super Fine – In the majority of cases, using super fine grit is simple to polish or buff the item after everything else in the process has been done. If you have a project where you don’t plan on staining or varnishing, super fine grit adds a nice shine to the item and a softness that many love. It can also be used to polish certain metals as well. There are many types of belt sanders available on the market today. The best way to find the perfect one for your needs is to first know what those needs are. Next, make sure you know the features that you want in the belt sander you choose. Things like power, SFPM speed, size, shape, and extra features all will help determine the best belt sander for your projects. The information in this buyer’s guide and the reviews we provided of the top three belt sanders will help save you a lot of time when it comes to researching. You have all the knowledge you need to look at the different belt sanders available and make an informed decision that will provide you with the performance and results you want from your sanding projects. Introduction Trying to use a clogged kitchen sink can be one of the most annoying things to deal with when working in your kitchen….